I was a little worried about Kristi Yamaguchi (click to read Kristi’s blog) & Mark Ballas since they got some low scores from the judges. But they were the first team to be saved! It’s going to be tough to pick who’s going to go home next week. I think my pick in the beginning of the season Kristi Yamaguchi (click to read Kristi’s blog) & Mark Ballas will be back to dance again. Even though they were not in first place (as the previous week), they still think they will win the glass ball at the end of the season. Who will go home from the rest of the teams still dancing? It’s getting pretty tough to pick them. But I would have to pick Shannon Elizabeth and Derek Hough to be the next team to voted off. OK, that is more a personal pick on who I think should go home. I didn’t care for their outburst last week. Plus it looked like the judges were afraid of giving them a low score because they didn’t want Shannon (and maybe Derek) to cry… AGAIN. This is one of my favorite lists. Grimace painfully while smacking your forehead and muttering: Shut up, dammit, all of you just shut UP! Whistle the first seven notes of It’s a Small World incessantly. Crack open your briefcase or purse, and while peering inside ask: Got enough air in there? Lean over to another passenger and whisper: Noogie patrol coming! On the highest floor, hold the door open and demand that it stay open until you hear the penny you dropped down the shaft go plink at the bottom. Stare, grinning, at another passenger for a while, and then announce: I’ve got new socks on! When at least 8 people have boarded, moan from the back: Oh, not now, damn motion sickness! Frown and mutter gotta go, gotta go then sigh and say oops! Sing Mary had a little lamb while continually pushing buttons. Holler Chutes away! whenever the elevator descends. Walk on with a cooler that says human head on the side. Stare at another passenger for a while, then announce You’re one of THEM! and move to the far corner of the elevator. Burp, and then say mmmm…tasty! Wear a puppet on your hand and talk to other passengers through it. When the elevator is silent, look around and ask is that your beeper? Say Ding! at each floor. Say I wonder what all these do and push the red buttons. Draw a little square on the floor with chalk and announce to the other passengers that this is your personal space. Take a bite of a sandwich and ask another passenger: Wanna see wha in muh mouf? Announce in a demonic voice: I must find a more suitable host body. Wear X-Ray Specs and leer suggestively at other passengers. Stare at your thumb and say I think it’s getting larger. If anyone brushes against you, recoil and holler Bad touch! As the story goes, my Mom and Dad went went to the same school when they were young. Then in his freshman year, my Dad wrote in his year book: Joe + Lydia (my parent’s names). 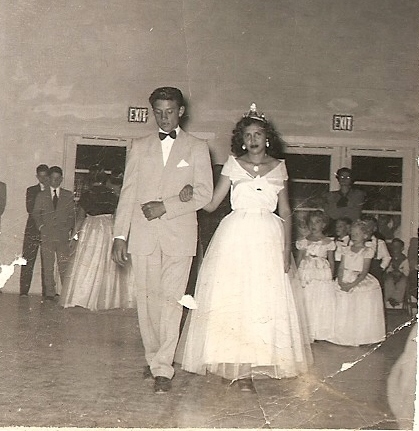 Here is a picture of them at a school dance. It is strange seeing pictures of my parents when they are so young (and in this picture, they weren’t even married yet). I just remember how they look when I was growing up and how they look now. I had the chance to go to the Witte Museum in San Antonio and see the Our Body: The Universe Within. It was totally amazing. I had seen programs on the exhibit and read about it on the internet. So when I found out it was coming to San Antonio, I knew I had to go see it. OUR BODY: THE UNIVERSE WITHIN is a fascinating, artful and educational exhibit consisting of actual human bodies and organs. Appropriate for all ages, this exhibit literally goes “under the skin”, revealing the mysteries of the human anatomy. The bodies, specimens and organs have been preserved using a process known as polymer impregnation. OUR BODY: THE UNIVERSE WITHIN allows you the insight to the inside: giving one a true look at the inner workings of the extraordinary human body. When you first walk into the exhibit, it’s dark and there is some kind of music playing in the background. You start off by reading some information on when and how they started mapping the human body. Then you turn the corner and you see your first “body” riding a bike. I just kept looking at the eyes on the body. It was hard to believe how they preserve the bodies so you can see everything! Then of course you start smelling the air to see if there is a “smell”. But you read that “The specimens are completely dry and odorless.” But you still check (and I wasn’t the only one). There were several complete human bodies in the exhibit and each one of them had a different system. And there were other anatomical specimens of the human body. It is one thing reading about these systems in a book, but when you can see it in the human body, it is a totally different experience. If this exhibit comes to your town, make the time to go see it. It is totally worth it. OLDSMAR, Fla. – And some people get jittery about mice in the kitchen. Sandra Frosti, a 69-year-old central Floridian, found an 8-foot long alligator prowling in her kitchen late Monday night, authorities said. Frosti said the gator must have pushed through the back porch screen door and then went inside through an open sliding glass door at her home in Oldsmar, just north of Tampa. It then apparently strolled through the living room, down a hall and into the kitchen. I get freaked out when I see a bug running across the floor. I turn on all the lights and find the closest thing to try to kill it. That could be a shoe or spray (hair spray, window cleaner, body spray, any kind of spray). But I’m really not sure what I would grab if I saw an 8-foot alligator in my kitchen.